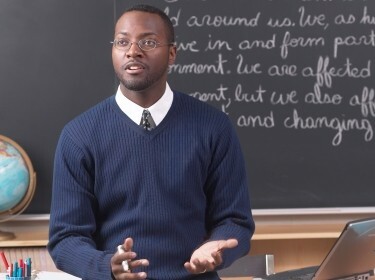 Value-added models, or VAMs, attempt to measure a teacher's impact on student achievement—that is, the value he or she adds—apart from other factors that affect achievement, such as individual ability, family environment, past schooling, and the influence of peers. VAMs attempt to estimate a teacher's contribution to students' progress over time. The goal of VAMs is to allow educators and policymakers to make apples-to-apples comparisons among teachers in terms of how much content their students learn each year, regardless of the students' characteristics. This means focusing not on how students test at a single point in time but rather on how much improvement they make from one testing period to the next. VAMs use statistical methods to account for students' prior characteristics. There is no single VAM that all researchers use, but all of the models account in some way for the prior test scores of a teacher's students. One common VAM method works like this: Mr. Johnson teaches 6th grade math. To estimate his added value, statisticians obtain the 4th and 5th grade test scores of all his students, as well as information about their backgrounds (such as whether they were in a gifted program or a special education program). Those data are used to predict what the students' 6th grade math scores will be. Caryn and Darren are students in Mr. Johnson's class. Caryn's actual score on the 6th grade test is seven points higher than predicted; Darren's is two points lower. Mr. Johnson's value-added estimate is the average of the differences between the actual and predicted scores of Caryn, Darren, and the rest of the class. Value-added estimates enable relative judgments but are not absolute indicators of effectiveness. Because VAMs adjust for students' prior performance and background characteristics, one teacher's value-added estimate can be compared with another's. For this reason, VAMs are sometimes used to rank teachers who teach the same subject and grade level. However, there is no specific number that identifies “acceptable” performance.